The House and Senate have different ideas on whether to boost staffing at components of the Homeland Security Department, but both chambers of Congress appear to agree that President Trump’s requests are unrealistic and thus far have declined to meet them. In its fiscal 2019 budget, the White House suggested that Customs and Border Protection hire 750 new border agents and an additional 150 support staffers. Immigration and Customs Enforcement sought funding for 2,000 new agents and 1,300 support personnel. The hiring was proposed as a down payment on Trump’s mandate that DHS hire 5,000 Border Patrol agents and 10,000 new ICE agents. In a measure approved by the Senate Appropriations Committee, lawmakers agreed on a bipartisan basis the proposals were ill-advised. The senators did not include funding for ICE to boost its Enforcement and Removal Operations, the office Trump had suggested for increases. “The Senate bill does not fund the hiring of a single additional ICE agent or provide any funds for additional detention beds over the FY 2018 level,” said Jay Tilton, a spokesman for Democrats on the appropriations panel. House appropriators, meanwhile, provided $78 million for ICE to hire 400 new law enforcement personnel, as well as additional support staff. They proposed funding the 500 Border Patrol agents Trump requested in fiscal 2018, which Congress never allotted, as well as $41 million for 140 new canine teams. The Senate would fund 375 new Border Patrol agents, in addition to the same number of new officers at ports of entry. The senators noted that CBP “continues to struggle” to meet its hiring initiatives, and proposed $45 million for recruitment and retention programs and $28.6 million for human resources enhancements. 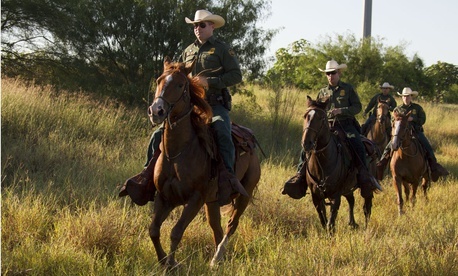 The House bill would provide $18.5 million for Border Patrol retention bonuses. CBP has suggested that new incentive programs and recruiting efforts such as advertising campaigns have demonstrated a positive return on investment. Senate appropriators, however, had their doubts. “It remains unclear to the committee whether these discrete efforts are truly components of a larger strategy,” the lawmakers wrote in their report. They requested a report from the agency on all of its recruitment and retention initiatives and the effectiveness of each program. 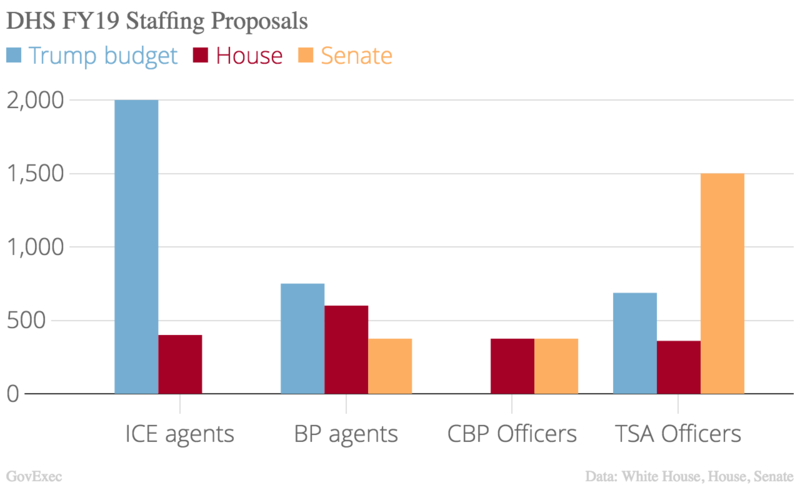 Both chambers pushed for CBP to create a staffing model and provide it to their committees, a yet-unfulfilled requirement lawmakers included in last year’s appropriations measure. The agency has made improvements in its dozen-step hiring process, leading to faster results. CBP has made revisions to its polygraph tests, though still just 26 percent of potential Border Patrol agents passed it last year, according to a recent Government Accountability Office report. It has also made adjustments to its physical testing and has received direct hire authority from the Office of Personnel Management for law enforcement jobs. In addition, CBP has signed a contract with Accenture worth up to $297 million to help with the recruiting and hiring process, which GAO said “seems promising” but is still too early to definitively assess. Accenture has collected $43 million so far and onboarded around 600 new employees. In the first year of the contract, CBP is paying the vendor $40,000 per new employee hired. ICE also proposed a contract to help it hire 16,600 additional employees, but ultimately canceled the proposal due to a lack of funding. The agency said it would rebid the contract in fiscal 2019. For two consecutive years, CBP has advised lawmakers in their final appropriations bill to reduce its allocation for personnel by more than $200 million because its payroll costs were set to fall short of its projections. The agency saw a net decrease in employees in 2017, a trend that has continued in 2018. New deportation officer hires dropped in half in 2017. The Senate bill also contains funding for nearly 1,500 new Transportation Security Administration employees to “staff checkpoints and mitigate wait times.” The House bill proposed an increase of just 360 employees, while Trump’s budget requested about 700. The differences between the bills will likely be resolved in a conference committee after each chamber passes its respective measure.